On Monday, the Select Committee on Citywide Mandatory Housing met to discuss the status of the Mandatory Housing Affordability (MHA) plan and to respond to public concerns. The Office of Housing (OH) spent much of its time addressing two common concerns: the public’s preference for “performance” over “payment,” and where OH should be able to spend money raised through payments. The Citywide MHA, as many of our readers may know, is a major city-wide initiative to increase the number of affordable housing units through a combination of zoning changes and new requirements for residential developers to either 1) set aside a certain percentage of units for affordable housing (“performance”), or 2) make payments to the Office of Housing to go toward other affordable housing projects (“payment”). The committee reviewed the basics of the MHA plan, addressed public concerns, and delivered some preliminary data from a 2017. You can see the full presentation here. OH spent much of its presentation time debunking misconceptions. Misconception 1: performance is more desirable than payment. The public has repeatedly expressed a preference for “performance” over “payment.” While performance ensures that developers create local affordable housing, OH emphasized that payment is necessary to meet affordable housing goals for two reasons. First, due to the rate of unit production, performance simply does not provide enough housing on its own. Second, OH can use payment dollars to partner with public and private funding sources, effectively tripling or even quadrupling their investment. OH stressed that both provide high-quality affordable housing, and their strategy requires using both contributions. Misconception 2: money collected through payments would not be spent in the neighborhoods it was collected. The concern is that some neighborhoods will be left out of the process. The real answer is more complicated. MHA’s Environmental Impact Statement (EIS) evaluates OH’s guidelines for where OH should emphasize investing in more affordable housing. The department uses two metrics: risk of displacement and access to opportunity. It advocates investing more affordable housing in low risk, high access areas, to limit gentrification in minority communities and open more doors for residents. 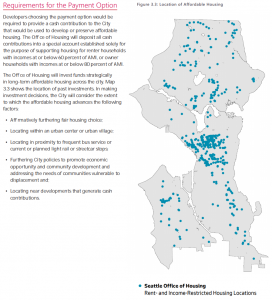 On the other hand, OH has affordable housing projects in almost all neighborhoods (the glaring exception being neighborhoods dominated by single-family houses), and it claims that exact levels of investment cannot be predetermined. Above is a list of guidelines the MHA will use to build new affordable housing and a map showing current affordable housing projects. The department’s objective is to create affordable housing in urban cores and areas with access to public transportation, while also “addressing the needs of communities vulnerable to displacement.” In short, OH plans to spend the money where it will have the greatest effect, but in the long run it says that it will invest across the city. Even though the full city-wide MHA won’t become law for some time, The Council used separate legislation to speed up the process in several neighborhoods, and we now have preliminary data. As of December 31, 2017, four projects have made contributions under MHA code. 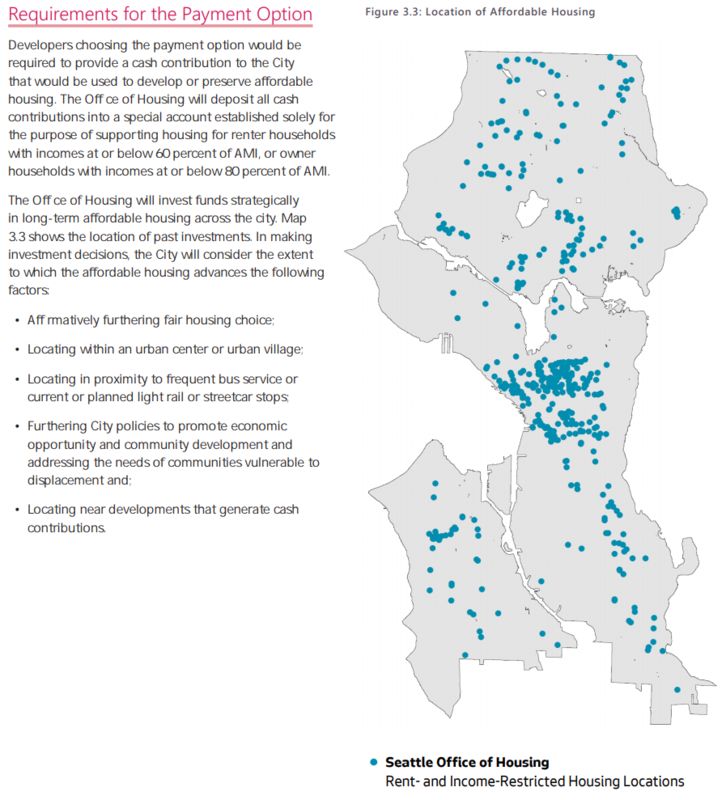 The table below shows that the first four MHA projects created 19 affordable housing units for people making under 60% of Seattle’s average median income (AMI), and raised just over $100,000 to support other affordable housing initiatives. While these numbers are small, they only apply to developments that vested after February, 2018. Most projects that began acquiring permits in 2017 will not make their contribution until next year. Check back next July for a more robust, meaningful data set. 1) If the Hearing Examiner rejects all nine cases, the committee would only have to meet five or six more times and a final council vote could happen as early as Q1 2019. 2) If the Hearing Examiner asks for minor revisions to the EIS, it would take two or three months to put the legislation back in front of the council after amending the EIS. 3) If the Hearing Examiner asks for major revisions, the committee would have to submit a new EIS (an 8-12-month process) and the public could make new appeals, possibly delaying a final vote to 2020. Now the city waits with bated breath for the Hearing Examiner’s ruling. The select committee meeting on Monday, July 30th has been cancelled, so the next meeting will be on Monday, August 6th. However, with the consideration of Carmen Best for Chief of Police scheduled to begin that week, that meeting will also likely be cancelled. As noted above, the Hearing Examiner should give its ruling sometime in Fall 2018.